President Muhammadu Buhari’s position on the June 12, 1993 presidential election could be hit by questions on legality. On Wednesday, he declared the late Moshood Kashimawo Olawale (MKO) Abiola won the poll and conferred on him the nation’s highest honour, the Grand Commander of the Federal Republic (GCFR). He followed this, yesterday, with a directive that Attorney General of the Federation and Minister of Justice Mallam Shehu Malami gazette the presidential order that declared June 12 as Democracy Day, and the names of some heroes of democracy who would receive national honours on the day, next week. At the House of Representatives, yesterday, Edward Pwajok (APC, Plateau) drew lawmakers’ attention to the Public Holidays Act, which declares May 29 as Democracy Day, saying for Buhari’s proclamation to take effect, the Act would have to be amended. A Senior Advocate of Nigeria (SAN), Pwajok explained that a contestant has to be declared winner by the National Returning Officer before he can be referred to as president-elect. He noted that there was a court order prohibiting the then National Electoral Commission (NEC) from releasing the result, stressing that this would, first, have to be set aside or overruled by a higher court. 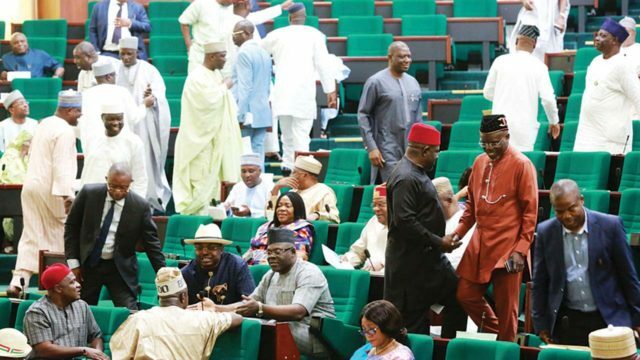 Nicholas Osai (PDP, Delta) challenged the declaration, condemning it as yet another usurpation of legislative powers by the executive arm of government. He argued that a mere declaration by a president is incapable of changing an Act of parliament. Due process must, therefore, be followed through an amendment of the Public Holidays Act. At this point, the lawmakers erupted with loud voices, apparently trying to shout him down. Others urged him on. Osai found an ally in Toby Okechukwu (PDP, Enugu) who insisted the country must be ruled by law and not by persons or groups. He said though Buhari had good intentions, the declaration has to be guided by law. This, according to him, would forestall future challenges to the honour done Abiola. The uproar lasted over 20 minutes. Speaker Yakubu Dogara restored order and forwarded the motion to the Committees on Justice, and Rules and Business, mandating them to look into the matter and make recommendations before the House arrives at a decision. Citing section 2 (1) and (2) of the Honours Warrant of the National Honours Act 1963, which borders on eligibility for appointment to Orders, former Chief Justice of Nigeria, Alfa Belgore, had reportedly described the award as illegal. Senator Dino Melaye had also insisted the Act provides that only Nigerian citizens could be eligible, arguing that since Abiola is dead, he is not a Nigerian in the context of the Act. Abuja-based lawyer, Abubakar Sani, said legally speaking, it might be wrong under the National Honours Act for the president to give such an award to a dead Nigerian, when the Act provides that the honour should be for serving or past heads of states. He stressed that the decision is more political than legal. “Abiola was never sworn in. Yes, he was presumed to have won the election, but he didn’t serve. So, going by that, one may say that he doesn’t deserve it. “But it is uncharitable for anyone to say he should not be given the honour because Abiola and his wife paid a huge price for our democracy. It is very understandable that the motivation is more political than legal,” said Sani. He, however, added no one can successfully challenge it in court, even if the decision was taken illegally. Meanwhile, in its deliberations, yesterday, the Senate urged Buhari to pay the family of the late M.K.O. Abiola all the entitlements due a former president and commander-in-chief of the Federal Republic of Nigeria. It also asked him to mandate INEC to announce the suspended results of the election. The resolutions followed adopted Order 42 and 52 raised by Senator Biodun Olujimi (PDP, Ekiti). “Mr. President, my distinguished colleagues. I want to thank Mr. President (Buhari) for the feat he scored yesterday by posthumously honouring the late M.K.O. Abiola for winning the annulled 1993 presidential election. To make good his intentions, I would implore him to ensure the release and declaration of the annulled presidential results by INEC,” said Olujimi. Deputy Senate President Ike Ekweremadu, however, submitted that a posthumous award is a constitutional matter and called for a legitimising amendment. In yet another twist to their faceoff, the Inspector General of Police, Ibrahim Idris, has taken Saraki to the Federal High Court, Abuja, for calling him an enemy of democracy. Speaking through his counsel, Alex Iziyon (SAN), yesterday, Idris sought leave of court to challenge the Senate’s resolution of May 9, wherein he was declared unfit to hold public office within and outside Nigeria. Delivering ruling on the application, Justice John Tsoho said the applicant had shown sufficient interest to be granted leave of the court to move action against the respondents. Tsoho, therefore, ordered that the processes be served on the respondents through the Clerk of the National Assembly, and adjourned the matter till June 27 for the application on notice. This came as Saraki confirmed he had sent to the police his defence against allegations he had links with the masterminds of the April 5 bank robbery in Offa, Kwara State. The Senate President, however, refused to divulge the content of the letter. “You can’t expect the Senate President to release that statement because the police never released to the public their own letter, which they sent to him. Saraki believes in due process of law and is a law-abiding citizen,” a source close to his office explained. Reacting, Rivers State governor, Nyesom Wike, warned that the allegations against Saraki could hurt the nation’s chances of courting investors. At his investiture as an honorary fellow of the Nigerian Institute of Public Relations in Port Harcourt, yesterday, Wike stressed that while no one is above the law, due process must be followed by security agencies.